By Surina Hariri, Nur Ain Mustafa, Muhd Khir Hafifi Muid, Sharon Kalu Joseph Ufere, Kasun Karunanayaka, Adrian David Cheok. The digital stimulation of smell is considered as a useful step in expanding the technology related to multisensory communication. Previous methods for activating the sensation of smell chemically, has several disadvantages such as lower controllability, expensive, needed to be refilled, and being complex. 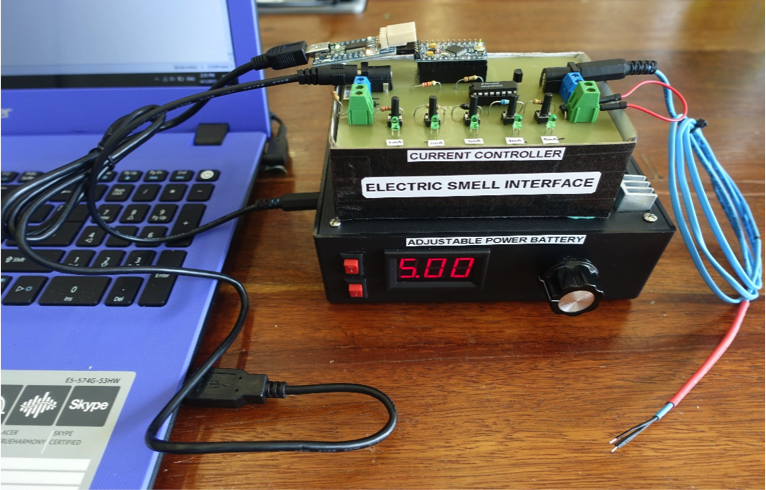 In this project, we are researching on developing a new interface that can induce weak electrical pulses on the smell receptors and generate smell sensations (The concept of this interface is shown in Figure 01). We believe by using a weak electrical signal can excite the smell receptors and generate smell perceptions. The sensitivity and effectiveness of electrical stimulation towards human smell receptors will be tested using a current controller device. The device as in Figure 2 is equipped with adjustable parameters; adjustable frequency and current to produce electrical pulses required. The stimulation process including putting a pair of customized silver electrodes inside the part of the nose where it touches the olfactory nerves. Figure 2: Picture of the Digital Smell Interface. 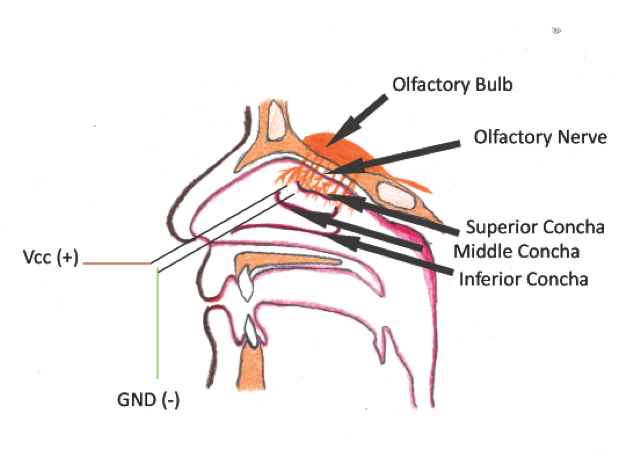 Generally, the smell sensitive receptors are located near the olfactory bulb and nasal concha (The anatomy of the nasal conchae shown in Figure 3). There are three regions inside the nostrils called superior nasal concha, middle nasal concha and inferior nasal concha which are nearest to the olfactory receptors where stimulating electrode could be placed. Therefore, we mainly stimulate receptor cells in this area in purpose to trigger smell related perceptions in the human brain. The placement of electrodes will be done with a help of a medical expert in a way that electrodes would not come off quickly. These electrodes will be controlled by our own special designed circuit that can deliver few mili-amperes of current pulses to the smell sensitive cells. Figure 3: The inner part of the nasal conchae and the placement of the electrodes. In most of the olfactory system related studies examining electrical activity of the olfactory bulb, an adequate olfactory stimulus such as blowing odorous air into the nose has been used as a routine method of activating the olfactory bulb. Only few attempts has been made to do a electrical stimulation of the olfactory system. In 1961 Yamamoto has stimulated the human olfactory mucosa by electrical pulse to detect the bulbar potentials. Electrical stimulation (2 mA, 0.5 ms) of the human olfactory mucosa evoked a change in potential recorded from the frontal sector of the head. Ishimaru et al. has conducted an experiment in 1997. During that experiment the properties of the olfactory bulb potential evoked by electrical stimulation of the olfactory mucosa were studied in rabbits immobilized with d-tubocurarine. The evoked potential was a slow negative wave when recorded from the surface of the bulb. Therefore, this field is still remained as an untouched area for exploration of new possibilities until today. In 2002 Ishimaru et al. concluded that electrical olfactory evoked potential (EOEP) is suitable for electrophysiology. The relationship between the EOEP and Toyoda and Takagi’s perfumist’s strip method T&T olfactometry which is a standard Japanese means of psychophysical olfactometry are investigated. Electrical stimulation via bipolar electrodes (2mA, 0.5ms, 300 trials) is feed to the olfactory mucosa. 4 channels of EOEP are amplified, filtered (2 to 250Hz) and recorded. During electrical stimulation of right or left of the olfactory mucosa evoked an electrical olfactory evoked potential. However, there is no sense of smell occurred. Tali et al. also concluded that indiscriminate electrical stimulation of the olfactory mucosa does not produce olfactory perception but does alter activity in deep brain structures. We hope in future, we will be able to develop a combined interface where we can effectively regenerate smell sensations digitally. This digital regeneration of smell will be useful for several industries like gaming, virtual reality, entertainment, online marketing, where people can create content, information, food related to smell that can be shared, learned, and experienced. In Medical industry this research will be useful to treat patients who are suffering from medical conditions like Ansomia and Parosmia. Yamamoto C., (1961). Olfactory bulb potentials to electrical stimulation of the olfactory mucosa. The Japanese journal of physiology, 11(5), 545-554. Ishimaru, T., Shimada, T., Sakumoto, M., Miwa, T., Kimura, Y., & Furukawa, M. (1997). Olfactory evoked potential produced by electrical stimulation of the human olfactory mucosa. Chemical senses, 22(1), 77-81. Ishimaru, T., Miwa, T., Shimada, T., & Furukawa, M. (2002). Electrically stimulated olfactory evoked potential in olfactory disturbance. Annals of Otology, Rhinology & Laryngology, 111(6), 518-522. Weiss, T., Shushan, S., Ravia, A., Hahamy, A., Secundo, L., Weissbrod, A., Ben Yakov, A. & Sobel, N. (2016). From Nose to Brain: Un-Sensed Electrical Currents Applied in the Nose Alter Activity in Deep Brain Structures. Cerebral Cortex.